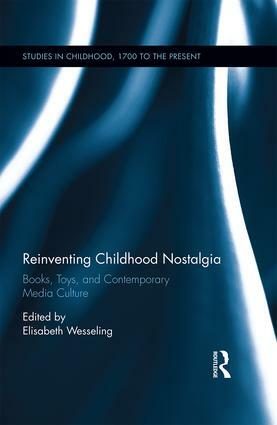 While Romantic-era concepts of childhood nostalgia have been understood as the desire to retrieve the ephemeral mindset of the child, this collection proposes that the emergence of digital media has altered this reflective gesture towards the past. No longer is childhood nostalgia reliant on individual memory. Rather, it is associated through contemporary convergence culture with the commodities of one's youth as they are recycled from one media platform to another. Essays in the volume's first section identify recurrent patterns in the recycling, adaptation, and remediation of children's toys and media, providing context for section two's exploration of childhood nostalgia in memorial practices. In these essays, the contributors suggest that childhood toys and media play a role in the construction of s the imagined communities (Benedict Anderson) that define nations and nationalism. Eschewing the dichotomy between restorative and reflexive nostalgia, the essays in section three address the ethics of nostalgia in terms of child agency and depictions of childhood. In a departure from the notion that childhood nostalgia is the exclusive prerogative of narrative fiction, section four looks for its traces in the child sciences. Pushing against nostalgia's persistent associations with wishful thinking, false memories, and distortion, this collection suggests nostalgia is never categorically good or bad in itself, but owes its benefits or defects to the ways in which it is brought to bear on the representation of children and childhood. Elisabeth Wesseling is Director of the Centre for Gender and Diversity at Maastricht University, The Netherlands. This series recognizes and supports innovative work on the child and on literature for children and adolescents that informs teaching and engages with current and emerging debates in the field. Proposals are welcome for interdisciplinary and comparative studies by humanities scholars working in a variety of fields, including literature; book history, periodicals history, and print culture and the sociology of texts; theater, film, musicology, and performance studies; history, including the history of education; gender studies; art history and visual culture; cultural studies; and religion. Topics might include, among other possibilities, how concepts and representations of the child have changed in response to adult concerns; postcolonial and transnational perspectives; "domestic imperialism" and the acculturation of the young within and across class and ethnic lines; the commercialization of childhood and children's bodies; views of young people as consumers and/or originators of culture; the child and religious discourse; children's and adolescents' self-representations; and adults' recollections of childhood.